These are simple to make, bring a rustic element to the dinner table, and smell so lovely. *Bonus: they look like mini holiday wreaths! 1.) 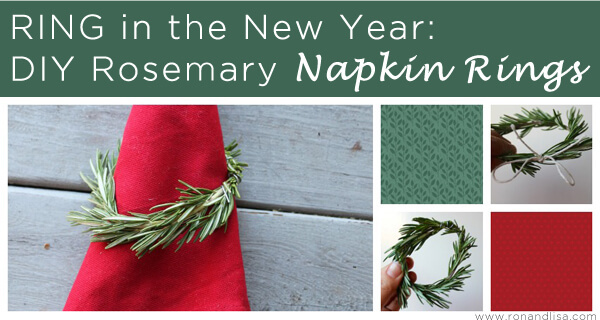 First, soak your rosemary in water for 5-10 minutes to make them easier to bend (they will likely snap otherwise). 2.) Then take a sprig (or 2, if they are on the shorter end) and form a circle. 3.) Secure the ends together using floral wire. You can cover the floral wire with twine or green floral tape, if you’d like. I just made sure to put the exposed wire behind the napkin so my guests can’t see it. 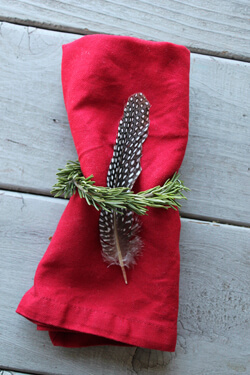 It really is that simple – so cute and a lovely addition to your holiday dinner table with a folded napkin inside of them. Lovely! Another cool idea is to make paper flowers from pictures of flowers in magazines and such. They adhere very well to the wire. Excellent website you have here but I was wondering if you knew of any user discussion forums that cover the same topics discussed in this article? I’d really love to be a part of community where I can get suggestions from other knowledgeable individuals that share the same interest. If you have any suggestions, please let me know. Thanks!